Our mural will be up at 3rd and Robertson through the end of August. 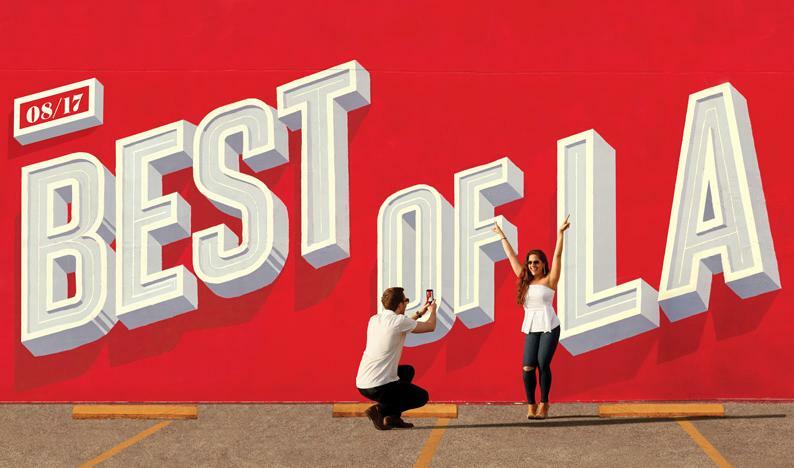 We fanned out across the region (that’s a lot of miles behind the wheel) to bring you the top places to shop, standout places to eat, and killer things to do. Because Carolina Orellana uses small batches (never more than five pounds) of pearlescent wild-caught Alaska pollock, her pescado ceviche tostada at La Cevicheria—cooked by lime and glazed with diced red onion—retains something wild and pristine. Choices abound on the one-page menu, including a brothy clam version boosted with Worcestershire sauce in the Guatemalan style. But it’s the shimmering $3 tostada that will have you crumbling shards of crisp tortilla into the juices for that last memorable bite. Nashville-style fried chicken, with its crisp coating drenched in chile paste and spices, has taken L.A. by storm. There are a few renditions to be found, but Howlin’ Ray’s, the Chinatown outfit from Johnny Ray Zone and wife Amanda Chapman, still tops the peppery heap for fried chicken that’s phenomenal—juicy, crunchy, seasoned beautifully—with or without the heat. Most of those people in line aren’t there for the “country,” the mildest of the bunch, but for the mouth-numbingly “hot” levels. The fried chicken sandwich and weekend-only waffles are not to be missed. Granted, L.A.’s baguettes aren’t as traditional as those at a Parisian boulangerie, reflecting instead the individual talents of local bakers, but that’s a good thing. Some versions are fluffy inside with a shattering crust; some have the tang of sourdough. Others are hearty with California-grown wheat. But none beckons a dab of quality French butter more than those produced by Colleen DeLee and sold at the Cheese Store of Beverly Hills Wednesday through Sunday. The self-taught baker turns out tender golden batons with just the right chew. 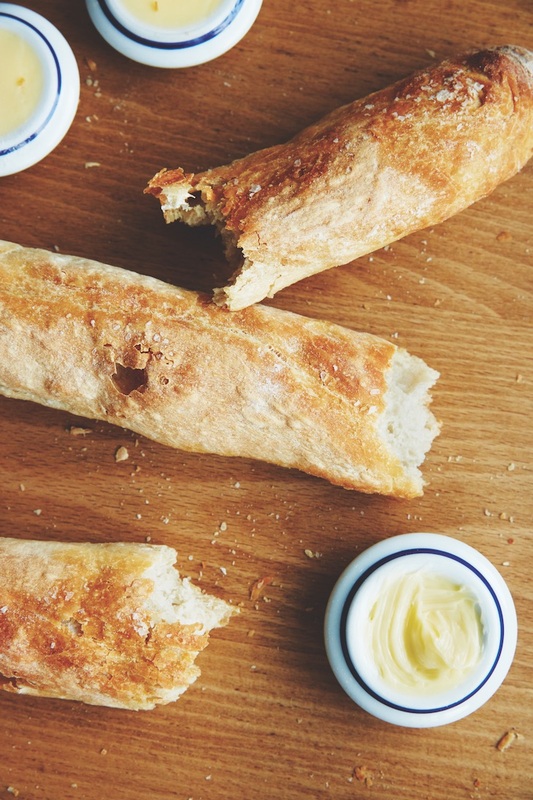 We’re not the only ones obsessed: Ludovic Lefebvre won’t serve any other baguette at his French bistro, Petit Trois. Prefer your comfort food with a cloth napkin and a wine pairing? The cozy, unstuffy gourmet shop and bar Esters has a $17 grilled cheese worth savoring ($21 if you want to add ham). The secret is the béchamel that binds it, upping the creamy richness and rounding out the salty bite of the Parmigiano-Reggiano, the sweet provolone, and the Reading Raclette’s mellow funk. It’s all held together by Milo & Olive’s pain de mie (aka white bread) and complemented by cornichons and a fizzy cocktail using one of Esters’s house-made shrubs. In a city that is suddenly overflowing with coffee craftsmanship, G&B coffee has managed to create something that stands apart. Its Business and Pleasure comes in three glasses: a bitter-tart shot of top-shelf espresso, a draught pull of its Fizzy Hoppy Tea (a cold-brewed black tea with Citra hops), and an almond-macadamia milk cappuccino that’s shaken like a cocktail, served neat, and dusted with espresso grounds. The complexity of the trifecta shines through as you sit at the marble bar, shifting between the permutations of sour, floral, and sweet. L.A. has entire cantinas devoted to tequila’s smoky cousin, but none is better stocked with spirits and knowledge than Las Perlas. You won’t find mezcal flights here; rather the bartenders delight in serving up bespoke booze tours through the villages of Oaxaca, where most of their 500 small-batch bottles are produced, with ribald tasting notes and trivia covering everything from the underground ovens that char the agave to the size of the plant whose juice you’re sipping. Just don’t ask about worms—mezcaleros are still trying to live down that marketing ploy. You know that sinking feeling: A few bites into that impressive hunk of meat you’ve ordered, and you’re already lamenting the wad of dough you’re spending on it. Next time try the bistecca fiorentina from Chi Spacca. And what does $220 buy you? 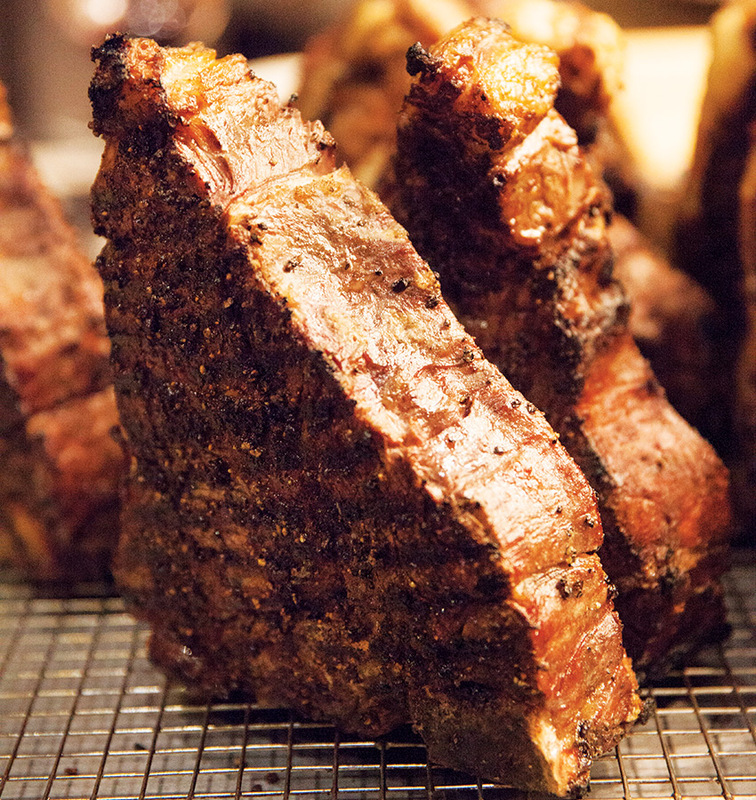 A 50-ounce dry-aged Black Angus porterhouse that is slowly grilled, upright on the bone, to a pretty pink. A drizzle of bright olive oil and crunchy flakes of salt are just the right finishing touches for a steak that never disappoints. At Marouch, a beloved standard-bearer of Lebanese Armenian cooking, the fattoush is not merely a base for grilled chicken or tofu. Served in a brown ceramic dish, the spirited mix of garlic-tinged cucumber, bell pepper, and green onion can hold its own in a definitive meze selection or whets the appetite between bites of such dishes as a charbroiled lamb kafte kabob. It arrives with an edging of crisp double-baked pita chips, added moments before the salad is presented. We tasted the pungent vegetable sliced into delicate strips and carved into Stonehenge-worthy circles, using batter methods both wet and dry. But it was the thick-cut, crispy onion rings at Pann’s that won us over. Made the same way since 1958, with wet and dry batters and fresh oil, they’re substantial without being greasy. As a bonus, you get to enjoy the midcentury side dish in a red leatherette booth at one of the last bastions of Googie architecture. She may be barely old enough to vote, but 20-year- old Clara Polito is no amateur in the kitchen. Working out of her Atwater Village home, she makes vegan pies, cakes, cookies, bars, and cannoli that outshine even her butter-reliant competitors. Polito’s goods are featured at Pizzanista! in Long Beach, Azla Vegan at Mercado la Paloma in South L.A., and Cruzer Pizza in Los Feliz; they’re also available by special order. San Gabriel was a place of orange groves surrounding a sleepy mission when Joe and Mary Claro opened the first of their Claro’s Italian Markets here in 1948. And while L.A. has seen its fair share of delis specializing in the comfort foods of the Apennine Peninsula, none has the old-world flavor of this postwar holdout, from the vintage decor and the sweet anise cookies to the vinegar-filled fusti and the 500-pound hunk of provolone. It’s also the place where the company produces fresh goods for its outlets in Covina, Upland, La Habra, Arcadia, and Tustin. Too often the pizza customized for those of us who must avoid gluten has a bland cracker crust that would put any pie aficionado off pizza for life. Not the version at Settebello, where the crust—made with flour from one of Italy’s top suppliers—is a Neapolitan-like offering that manages to maintain the qualities of its traditional sibling: chewy, almost wet in the center, with a bit of char on the blistered crust. Nonna would approve. It would be enough to find an inventive eatery serving modern-yet- homey Pan-Asian fare, such as the best double-fried gochujang-slathered chicken wings in town. Or a top-notch craft beer bar with taps featuring brewers like Modern Times. Or even a wondrously curated arcade with 50 machines (from BurgerTime to the six-player X-Men behemoth) and 11 pinball tables. But Button Mash has all this and more, including the PWNshop, which hawks Street Fighter-inspired fine art. The beverage, made from finely ground green tea leaves, is everywhere, with iterations that range from the purist versions of powder and hot water to supersweet creamy lattes. The Enishi-No-Shiro “Greensicle” Ippodo Matcha at Sqirl is the ideal melding of the two types. A lighter matcha, it’s shaken with almond milk, slightly sweetened with honey, and poured over a glass of ice. Get there by 1 or the velvety brioche at the boulangerie within Thomas Keller’s Bouchon will be gone. Expertly textured, without the added sweetness that makes so many brioche pretenders just shy of Hawaiian bread, this incarnation of the Normandy classic would make any Francophile happy. Though various newcomers make a fine sausage, Continental Gourmet Sausage Co. continues to dominate after 33 years in the game with its käsekrainer. The German deli came up with its version of the Austrian classic, which is filled with melting cheese, about six years ago in collaboration with chef Bernhard Mairinger for his bygone restaurant Bierbeisl. Suavely spiced, lightly smoked, and oozing creamy French Emmentaler, the sausage is magnificent with some mustard or horseradish, on a bun or solo on a plate. 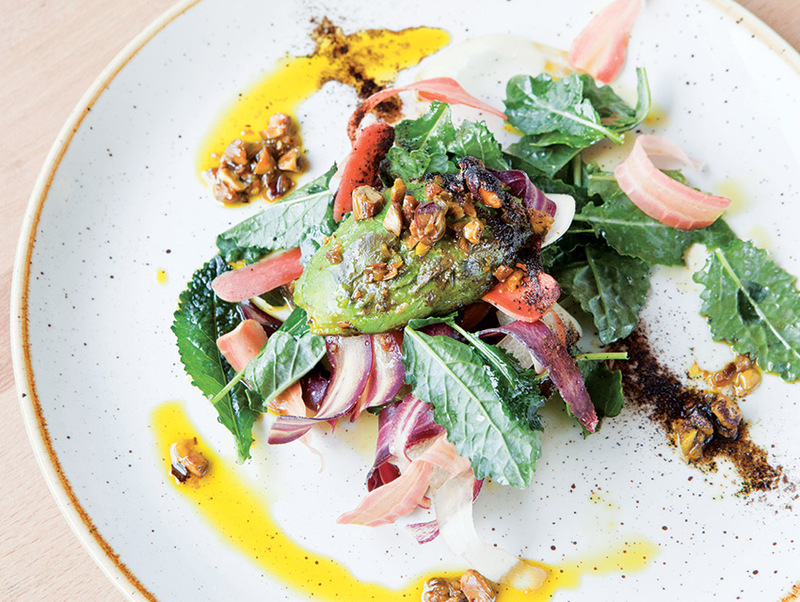 Many a talented chef has toyed with Persea americana, but Kevin Meehan’s charred avocado at Kali is a whole other level of good, adding notes of sweet and sour to the fruit’s creamy richness. A halved avocado is brushed with a stroke of avocado honey before the flash of fire, then sprinkled with a black garlic ash that enlivens the tropical opulence. A pistachio gremolata and bed of baby greens—picked in a nearby lot—provide a welcome sharpness. Boyle Heights has many purveyors of Puebla’s signature sandwich, the cemita—an overstuffed torta on a seeded roll—but there’s only one king: Juan Andrade. Known as “El Rey de las Cemitas,” he runs the Cemitas Tepeaca Puebla truck, piling mounds of avocado and stretchy quesillo cheese atop a slab of golden-fried chicken milanesa or a quarter-pound of tender lamb barbacoa that he serves on the best bread on the block. 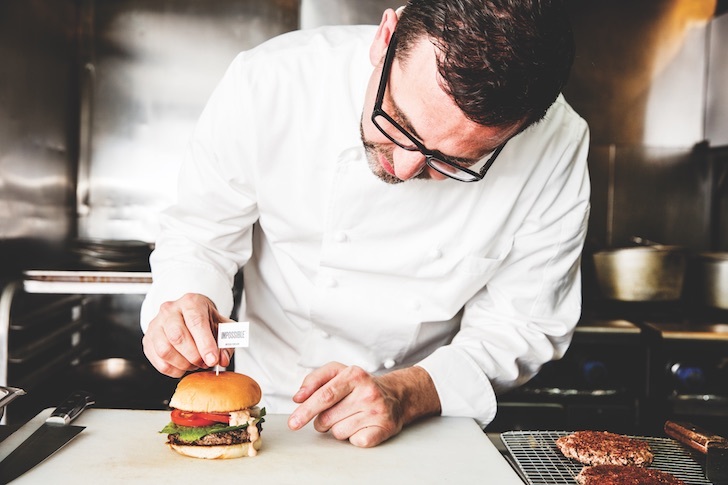 It’s a family recipe he’s been kneading since childhood. Add chipotles and pápalo leaf, and the piquant-pungent combo will have you convinced that Andrade is a wizard, too. If you’re a boss-level whiskey buff who needs 800 bottles to browse and no customer service, hit Del Rey’s cavernous Beverage Warehouse. But K&L Wine merchants has spirits others don’t and quality at lots of price points, from Iceland’s caraway-spiced Brennivín for $35 a liter to a 35-year- old Japanese single malt that runs $8,999. Sealing the deal, the shop also has well-informed staff who’ll match your tastes or gently guide you beyond. Rich broth. springy noodles. A sunny egg swimming in the bowl. A spike of chile. A sheet of nori. It’s everything you want in ramen, only this version doesn’t have a speck of pork. The plant-based spicy ramen at Ramen Hood is not only meat free, the broth is composed of sunflower seeds and white miso, the “egg” is soy milk and nutritional yeast, and you don’t need a nap after slurping down a bowl. Chef Rahul Khopkar, a Noma alum, teamed up with celeb chef Ilan Hall to create dishes that rival traditional tonkotsu. This pop-up from chef Debbie Michail and butcher Alex Jermasek, called Logmeh LA after the Farsi word for “savoring in one bite,” centers on an open fire, where a boar, goat, or lamb is roasted until succulent. Seasonings and sides—such as the sangak, an Iranian pebble bread—are inspired in part by Michail’s Iranian heritage and trips to Israel and Turkey. The dinners, about $125 per person, happen every few months. When’s the last time you were moved to say “oh my gosh” not once but three times during dessert? That’s standard fare when you’re eating the key lime pie at Fishing With Dynamite. The single-serving pies, inspired by a version made by chef David LeFevre’s mother, have a graham cracker crust filled with a chartreuse custard that’s equal parts sweet and tart (sure to please fans on either side of the key lime debate). A kaffir lime meringue is piped delicately on top, then torched golden brown for a toasted finish. While lox is traditionally made by brining salmon fillets, most of what we see on menus today is cold smoked before arriving on a bagel with schmear. There’s no better practitioner of this art than Wexler’s Deli. The salmon, imported from Denmark’s Faroe Islands, is rubbed with salt, sugar, spices, and herbs. Then it’s washed, dried, and smoked over both fruit- and hardwoods. The slices are nearly translucent, silken to the tongue, and that perfect balance of salt and sea. Knowledgeable guides weave the neighborhood’s cultural history into the three-hour, 1.5 mile-long culinary rambles offered by Avital Tours, created by Avital Ungar while she was studying in San Francisco to be a sommelier (she runs three tours in the Bay Area). Last year the UCLA graduate launched Venice and downtown jaunts. We especially love the former, where you’ll learn about the area’s skate/surf/art/bodybuilding roots between tasting stops at Venice high points like the Ale House, Gjelina, Plant Food + Wine, and Blue Star. Los Angeles has long been a salad town. 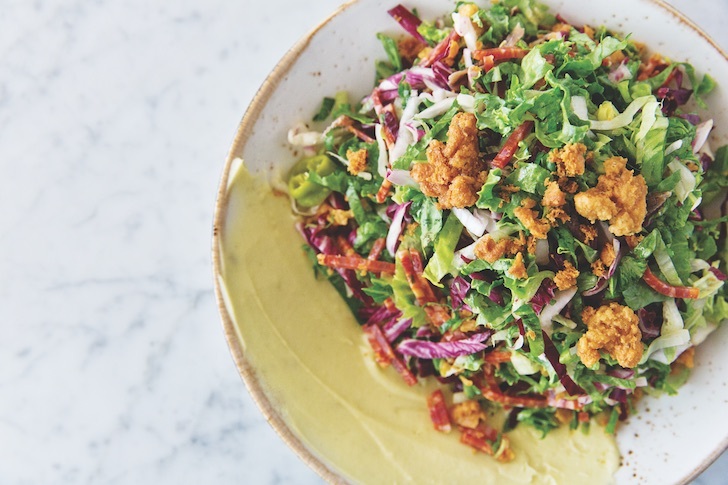 Our current darling is Alimento’s Chopped Salad Amigliorata, made with a chickpea puree, anchovies, and sun-dried tomatoes. 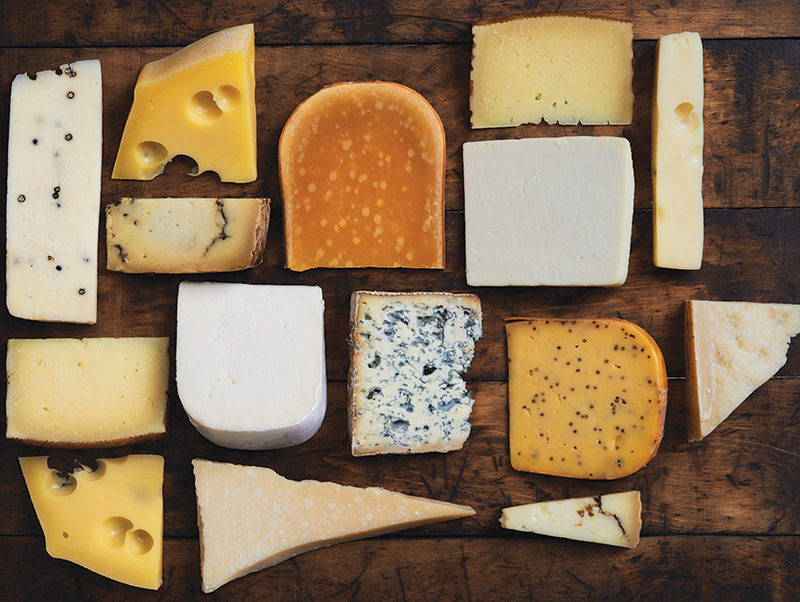 The Cheese 101 course at Andrew’s Cheese Shop is led by a playfully surly professor whose mien is a mix of neurotic George Costanza charm and Joe Rogan’s free-range passion. In roughly 90 minutes Andrew Steiner offers immersion into a world of monks, molds, regions, and rinds, where the French steal recipes from the Swiss to showstopping effect (the Beaufort “Gruyère”) and the Dutch dye curds to disguise morning-milk Gouda as the richer evening-milk variety. For the $40 fee you also get to sample up to ten cheeses plus wine and beer. Tangents and jokes are gratis. Founded by Providence’s Michael Cimarusti, Cape Seafood and Provisions is the only dock-to-dish seafood shop in L.A. Working with small local boats, the store features fish that larger operations ignore. Expect everything from whole mackerel to live Santa Barbara box crab to giant portions of halibut. Don’t skip the pantry and farmers’ market section, with delicacies like Persian mulberries and yuzu kosho. Whether it’s dished up from a vintage truck or the star of a destination restaurant, soft-serve ice cream speaks of summer. Here are four of our favorite places to sample the sweet treat. 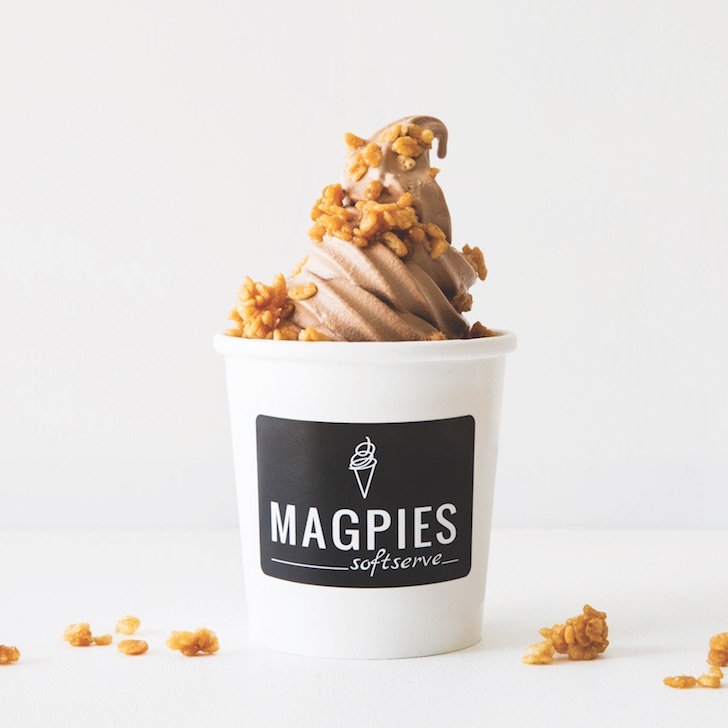 Magpies Softserve: Go for malted milk chocolate with sweet corn and almond, or strawberry cheesecake with sweet cream, and top with chocolate honeycomb, butterscotch Rice Krispies, and house-made sprinkles. Sweet Rose Creamery: Only the Pico shop in this ice cream empire offers seasonal flavors like milk gelato and dairy-free peach sorbet. (Yes, those two do taste amazing together.) Watch social media for new flavors; they change regularly. CVT Soft Serve: This is no standard ice cream truck operation. The cream comes from a local dairy, the flavors are classic vanilla and chocolate, and the soft-serve is whirled on refurbished vintage trucks named Charlie and Frankie. No adornments necessary. Manhattan Beach Post: The must-have dessert at David LeFevre’s South Bay spot is whatever soft swirl is on the menu, whether it’s salted caramel with green figs and pistachios or coconut with milk jam, peanuts, and sesame seeds. Where to Find Mexico’s Regional Specialties in L.A.